You know I’m a proponent of interfaith studies. I’ve studied Islam as a Catholic for over 12 years now. One thing I’ve realized is the importance of studying together – like actually sitting down with someone outside of your specific tradition. Go over the texts together. Interpret together. Dissect controversial passages together. Break bread together. Pray together. We can even disagree together. That’s okay too. But the important thing is being together. Side by side. Being together in the physical allows for more direct dialogue, education and understanding. That is, at least, my experience. My friends, we have more in common than we think. It’s time to start asking, “What is right with our traditions?” and seek answers from one another. 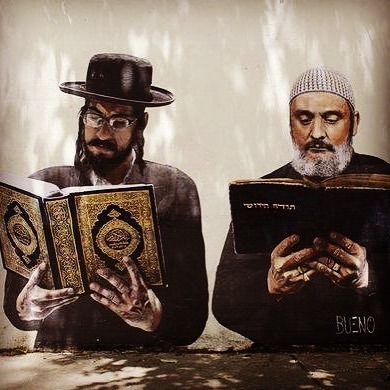 As a generation criticized for being ignorant and apathetic, we have the opportunity to smash stereotypes by embracing more empathetic and logical approaches to understanding our respective religions. I outlined some approaches above. Pluralism is possible, but we have to embrace it. That can only happen if we are together.